Things will be looking a little different at CityPlace come fall of 2019. That’s the projected completion date for a massive new City of Toronto project next to Canoe Landing Park that will include two new schools. Mayor John Tory and several other City of Toronto and school board officials were at the location on Wednesday morning to celebrate the start of construction of the Canoe Landing multi-use facility, formerly known as Block 31. There are approximately 20,000 people living in the area, which currently have limited access to local schools, child care or public recreation facilities, according to the City. 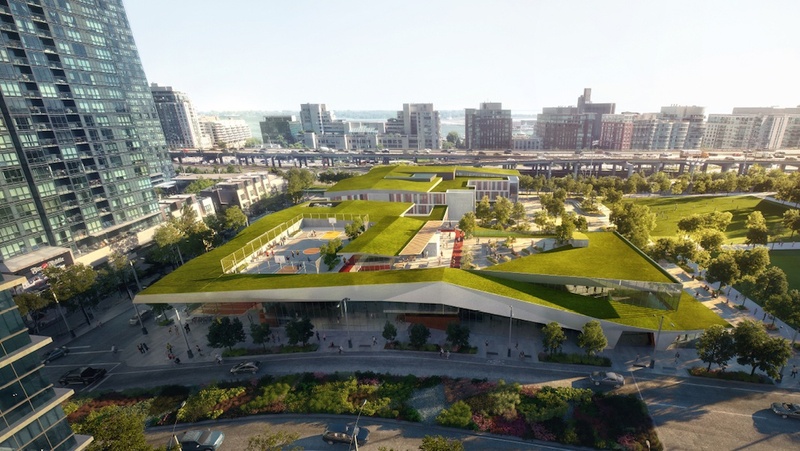 The new facility, which will be located at the corner of Fort York Boulevard and Brunel Court, will be integrated with the neighbouring Canoe Landing Park. The major development will include two elementary schools, a community centre and child care centre. Bishop Macdonell Catholic and Jean Lumb Public Schools will each serve 550 children from kindergarten to Grade 8. Canoe Landing Child Care Centre will serve a total of 54 children, from infants to preschoolers. The multi-use development will feature a green roof, shared gym, separate outdoor play areas for each age group, and numerous energy efficiency elements within a modern, three-storey structure. To finance the construction of this new facility, the City states its using revenue that was collected from development projects in the Railway Land area. As for the schools, registration will begin taking place in spring 2019.